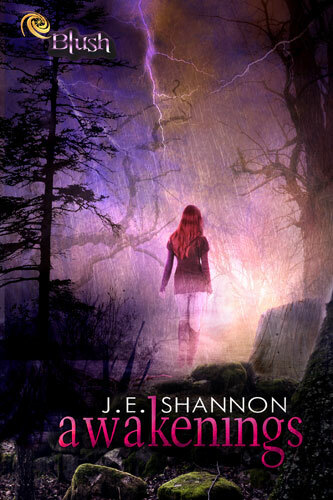 Welcome to my stop on the blog tour for Awakenings by J. E. Shannnon! I have a book spotlight for you today featuring an excerpt from the novel, and there's also a giveaway for you to enter! Evie Shepard awakens to a nightmare. She's been buried alive and has no idea how or why. As she struggles to remember what happened, she begins to notice changes—heightened senses, as well as increased speed, agility, and strength. And her heart no longer beats. She soon makes a disturbing discovery: she wasn't buried alive; she was murdered. Somehow, she has come back . . . and she wants revenge. Lightning strikes the ground, leaving behind a thick, black scorch mark. Within seconds, it strikes a second time, pausing briefly before giving a third earth-shattering blow. I don’t see the actual bolts—all I see is a flash of light, followed by my sister and me running, out of breath and terrified. Another flash, and we are huddled together in a rusted, abandoned car. Another burst of light, and the car door screeches open and we are being ripped away from each other by unfamiliar hands. It’s with that final memory that I open my eyes. As soon as I do, something grainy flows into them, so I shut them again. I can’t see, I can’t hear; but I can feel that I’m lying on cold earth. The longer I’m awake, the more I become aware of an unbelievable pressure on my chest. Slowly, I realize that it’s not just my chest—my face and body also feel as if I’m being crushed. Oily nausea roils through me, but I clench my teeth to stop myself from panicking. Where am I? I try to move my hands and find they’re pinned to my side. I try to open my eyes again and instantly get something in them. I flex my fingers, and the grittiness that slips through them makes me aware of the awful truth—I have been buried alive. I let out a shriek, but have to close my mouth as dirt begins to slip past my lips. Struggling frantically, I feel the earth move under my hands. I realize I can’t be buried very deep, or the pressure of the dirt would surely have suffocated me by now. I’m astounded it hasn’t already, though I have no way of knowing how long I’ve been underground. I force myself to be still, to stop and think about what I have to do. I need to be very careful getting out, making sure not to cause a cave-in and possibly crush myself. I need to remember to breathe shallowly or I will run out of oxy— And that’s when I realize that I’m not breathing. Not at all. To celebrate her new release, J. E. Shannon is giving away a Kindle with an ecopy of Awakenings (US only). One runner-up will win an ecopy of Awakenings (open internationally). You can enter here. Thank you so much for helping with my release tour. The cover of this caught my eye right away and the plot sounds creepy yet thrilling! The cover is definitely an attention-grabber- I really like it! I love the colors on this cover! Not breathing?!? Wow. So, I got trapped in my bathroom the other day. I live in an old house and the door handle broke. My cell phone was dead and I was trapped in there for 3 hours before I realized that my Kindle had Internet and I contacted my uncle who had to break into my house to let me out. Let me just say that after that experience, I KNOW that being trapped in the ground would absolutely terrify me. I tried to go all She-Ra on the door and it didn't work and I thought I was trapped with no way out. It sounds like an interesting read for sure. I bet there's a lot of emotion. Thanks so much for sharing! Jaclyn @ JC's Book Haven. Oh my God! I'm so glad that you were able to get help! I certainly would have freaked out, especially with a dead cell phone! Yikes! Being trapped underground is sooooo scary to me! If I could get past that scene it sounds like a thrilling read! And that cover is really eye-catching, I love the colours :) Thanks for bringing this one to my attention Lee! I wouldn't want to be trapped underground, either! I don't even like gardening that much because of all of the crawly things that live in the dirt!